A large rose-tree1 stood near the entrance of the garden: the roses growing on it were white, but there were three gardeners2 at it, busily painting them red. Alice thought this is a very curious thing, and she went nearer to watch them, and, just as she came up to them, she heard one of them say "Look out now, Five! Don't go splashing paint over me like that!" "I couldn't help it," said Five, in a sulky tone. "Seven jogged my elbow." On which Seven looked up and said "That's right, Five! Always lay the blame on others!" "You'd better not talk!" said Five. "I heard the Queen say only yesterday you deserved to be beheaded." "What for?" said the one who had spoken first. "That's none of your business. Two!" said Seven. "Yes, it is his business!" said Five. "And I'll tell him  it was for bringing the cook tulip-roots3 instead of onions." "Would you tell me, please," said Alice, a little timidly, "why you are painting those roses?" Five and Seven said nothing, but looked at Two. 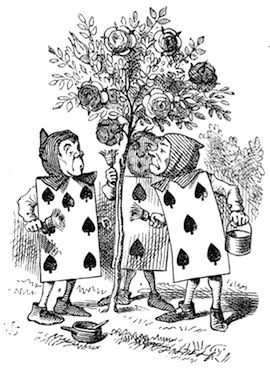 Two began, in a low voice, "Why, the fact is, you see, Miss, this here ought to have been a red rose tree5, and we put a white one in by mistake; and, if the Queen was to find it out, we should all have our heads cut off, you know. So you see, Miss, we're doing our best, afore6 she comes, to " At this moment, Five, who had been anxiously looking across the garden, called out "The Queen! The Queen! ", and the three gardeners instantly threw themselves flat upon their faces. There was a sound of many footsteps, and Alice looked round, eager to see the Queen. Alice was rather doubtful whether she ought not to lie down on her face like the three gardeners, but she could not remember ever having heard of such a rule at processions; "and besides, what would be the use of a procession," thought she, "if people had all to lie down on their faces, so that they couldn't see it?" So she stood where she was, and waited. When the procession came opposite to Alice, they all stopped and looked at her, and the Queen said, severely, "Who is this?" She said it to the Knave of Hearts, who only bowed and smiled in reply. "Idiot!" said the Queen, tossing her head impatiently; and, turning to Alice, she went on: "What's your name, child?" "My name is Alice,11 so please your Majesty12," said Alice very politely; but she added, to herself, "Why, they're only a pack of cards, after all. I needn't be afraid of them!" "And who are these?" said the Queen, pointing to the three gardeners who were lying round the rose-tree; for, you see, as they were lying on their faces, and the pattern on their backs was the same as the rest of the pack, she could not tell whether they were gardeners, or soldiers, or courtiers, or three of her own children13. "How should I know?" said Alice, surprised at her own courage. "It's no business of mine." The Queen turned crimson with fury, and after glaring at her for a moment like a wild beast, began screaming "Off with her head! Off with "
The King laid his hand upon her arm, and timidly said "Consider, my dear: she is only a child!" The Queen turned angrily away from him, and said to the Knave "Turn them over!" "Get up!" said the Queen in a shrill, loud voice, and the three gardeners instantly jumped up, and began bowing to the King, the Queen, the royal children, and everybody else. "Leave off that!" screamed the Queen. "You make me giddy." And then, turning to the rose-tree, she went on "What have you been doing here?" "May it please your Majesty," said Two, in a very humble tone, going down on one knee as he spoke, "we were trying "
"I see!" said the Queen, who had meanwhile been examining the roses. "Off with their heads!" and the procession moved on, three of the soldiers remaining behind to execute the unfortunate gardeners, who ran to Alice for protection. "You sha'n't be beheaded!" said Alice, and she put them into a large flower-pot that stood near.14 The three soldiers wandered about for a minute or two, looking for them, and then quietly marched off after the others. "Their heads are gone, if it please your Majesty!" the soldiers shouted15 in reply. "That's right!" shouted the Queen. "Can you play croquet?" "Come on, then!" roared the Queen, and Alice joined the procession, wondering very much what would happen next. "It's  it's a very fine day!" said a timid voice at her side.16 She was walking by the White Rabbit, who was peeping anxiously into her face. "Hush! Hush!" said the Rabbit in a low hurried tone. He looked anxiously over his17 shoulder as he spoke, and then raised himself upon tiptoe, put his mouth close to her ear, and whispered "She's under sentence of execution." "Did you say 'What a pity!'?" the Rabbit asked. "No, I didn't," said Alice. "I don't think it's at all a pity. I said 'What for?'" "She boxed the Queen's ears " the Rabbit began. Alice gave a little scream of laughter. "Oh, hush!" the Rabbit whispered in a frightened tone. "The Queen will hear you! You see she came rather late, and the Queen said "
"Get to your places!" shouted the Queen in a voice of thunder, and people began running about in all directions, tumbling up against each other: however, they got settled down in a minute or two, and the game began. Alice thought she had never seen such a curious croquet-ground in her life: it was all ridges and furrows: the croquet balls were live hedgehogs18, and the mallets live flamingoes19, and the soldiers had to double themselves up and stand on their hands and feet to make the arches. The chief difficulty Alice found at first was in managing her flamingo: she succeeded in getting its body tucked away, comfortably enough, under her arm, with its legs hanging down, but generally, just as she had got its neck nicely straightened out, and was going to give the hedgehog a blow with its head, it would twist itself round and look up into her face, with such a puzzled expression that she could not help bursting out laughing; and, when she had got its head down, and was going to begin again, it was very provoking to find that the hedgehog had unrolled itself, and was in the act of crawling away: besides all this, there was generally a ridge20 or a furrow21 in the way wherever she wanted to send the hedgehog to, and, as the doubled-up soldiers were always getting up and walking off to other parts of the ground, Alice soon came to the conclusion that it was a very difficult game indeed. The players all played at once, without waiting for turns, quarreling all the while, and fighting for the hedgehogs22; and in a very short time the Queen was in a furious passion, and went stamping about, and shouting "Off with his head!" or "Off with her head!" about once in a minute. Alice began to feel very uneasy: to be sure, she had not as yet had any dispute with the Queen, but she knew that it might happen any minute, "and then," thought she, "what would become of me? They're dreadfully fond of beheading people here23: the great wonder is, that there's anyone left alive!" She was looking about for some way of escape, and wondering whether she could get away without being seen, when she noticed a curious appearance in the air: it puzzled her very much at first, and she said to herself "It's the Cheshire-Cat: now I shall have somebody to talk to." Alice waited till the eyes appeared, and then nodded. "It's no use speaking to it," she thought, "till its ears have come, or at least one of them." In another minute the whole head appeared, and then Alice put down the flamingo, and began an account of the game, feeling very glad she had some one to listen to her. The Cat seemed to think that there was enough of it now in sight, and no more of it appeared. "I don't think they play at all fairly," Alice began, in rather a complaining tone, "and they all quarrel so dreadfully one ca'n't hear oneself speak  and they don't seem to have any rules in particular: at least, if there are, nobody attends to them  and you've no idea how confusing it is all the things being alive: for instance, there's the arch I've got to go through next walking about at the other end of the ground  and I should have croqueted the Queen's hedgehog just now, only it ran away when it saw mine coming24!" "Not at all," said Alice: "she's so extremely " just then she noticed that the Queen was close behind her, listening: so she went on " likely to win, that it's hardly worth finishing the game." "It's a friend of mine  a Cheshire-Cat," said Alice: "allow me to introduce it." "Well, it must be removed," said the King very decidely; and he called to the Queen, who was passing at the moment, "My dear! I wish you would have this cat removed!" The Queen had only one way of settling all difficulties, great or small. "Off with his head!" she said without even looking round. Alice thought she might as well go back and see how the game was going on, as she heard the Queen's voice in the distance, screaming with passion. She had already heard her sentence three of the players to be executed for having missed their turns, and she did not like the look of things at all, as the game was in such confusion that she never knew whether it was her turn or not. So she went off in search of her hedgehog. The hedgehog was engaged in a fight with another hedgehog, which seemed to Alice an excellent opportunity for croqueting one of them with the other: the only difficulty was, that her flamingo was gone across to the other side of the garden, where Alice could see it trying in a helpless sort of way to fly27 up into a tree. 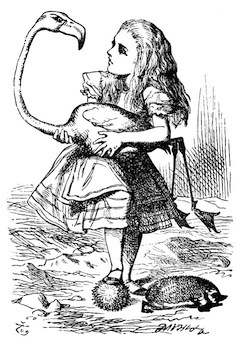 By the time she had caught the flamingo and brought it back, the fight was over, and both the hedgehogs were out of sight: "but it doesn't matter much," thought Alice, "as all the arches are gone from this side of the ground." So she tucked it away under her arm, that it might not escape again, and went back to have a little more conversation with her friend. When she got back to the Cheshire-Cat, she was surprised to find quite a large crowd collected round it: there was a dispute going on between the executioner, the King, and the Queen, who were all talking at once, while all the rest were quite silent, and looked very uncomfortable. The moment Alice appeared, she was appealed to by all three to settle the question, and they repeated their arguments to her, though, as they all spoke at once, she found it very hard to make out exactly what they said. The executioner's argument was, that you couldn't cut off a head unless there was a body to cut it off from28: he had never had to do such a thing before, and he wasn't going to begin at his time of life. Alice could think of nothing else to say but "It belongs to the Duchess: you'd better ask her about it." "She's in prison," the Queen said to the executioner: "fetch her here." And the executioner went off like an arrow. The Cat's head began fading away the moment he was gone, and, by the time he had come back with the Duchess, it had entirely disappeared: so the King and the executioner ran wildly up and down, looking for it, while the rest of the party went back to the game. In real life you would be hard pressed to find a rose-tree; roses grow on bushes or vines depending on species, and often the bushes are possessed of a thoroughly nasty selection of thorns. The only plant I've encountered with comparable ability to make a bloody mess of your hands is the blackberry bush. The suit of the gardeners is of course, spades! Tulips are originally from persia, and the onion-like bulbs are how they can survive for more than one year. They bloom, and then the blooms die as the plant withdraws nourishment and water from them to build the bulb. The bulb then lays dormant until growing conditions are favourable in the next year. Tulip bulbs are edible, as dutch survivors of the second world war know all too well. Unlike onions they have little to no real flavour. Bowing is fundamentally all about making yourself shorter than the person you are bowing to, reflective of every person's experience of being a child and therefore smaller than adults and without their authority. That said, like any other way of communicating a message, bowing doesn't always say the same thing to every person. It's easy to be fooled into thinking 'afore' is an example of 'lower class' english dialect and therefore a truncated form of 'before.' There is some accidental truth in the idea, in the sense that people who were not considered nobility in england did not absorb norman french into their speech in the same way as those considered nobility did, and therefore were more likely to preserve old english forms. 'Afore' is one of those old english words, meaning specifically in advance or in front of. 'Before' had a somewhat different meaning, 'from the front' as in moving on from in front of. 'Courtier' being a polite term for nobles staying at the palace where a monarch is presiding (and usually living off of said monarch's larder). It has been extended to refer to political toadies, and used as a metaphor for the relationship between employers and employees, especially in the fields of public relations and marketing. With all those connections, it is no surprise to learn that the term is highly pejorated today, although into rennaisance times the 'ideal' courtier was understood to be honourable, loyal, and skilled in gender-appropriate tasks. 'Knave' didn't always mean a male person of questionable character. It was originally a synonym for 'knight', meaning a boy or youth, usually one employed as a servant. Each one derives from old english precedents, cnafa 'boy' and cniht 'young slave.' Needless to say, cniht went up in the world while cnafa went down, dropping through servant to a servant in bad circumstances to an untrustworthy man. The other curious parallel between the words is that they both came to refer to young or even middle-aged men rather than boys. For more details, it is worth reading Sol Steinmetz' Semantic Antics. Cards have a controversial history. The christian church made every effort to stamp them out since they were used in gambling games, and Tarot cards in particular were understood to represent concepts from a rival religion or religions. Once the Tarot cards had been officially suppressed, the better known playing cards remained with their now obscure symbols and characters. The 'royal' cards took time to get established in the playing card decks, sometimes being fewer than the standard twelve, sometimes worked out as an all-male collection. The 'heart shape' so familiar on playing and valentine cards doesn't look much like a real heart at all, although it is rare for anyone to comment on this. The suit of hearts derives from the french style of playing cards printed in the 15th century. They became especially popular because they were mass-produced and therefore cheap. Other versions of the cards use other symbols, such as cups or (of course) roses. Among the many contrasts between Alice In Wonderland and Alice Through the Looking Glass is one well marked by Alice's reponse here. 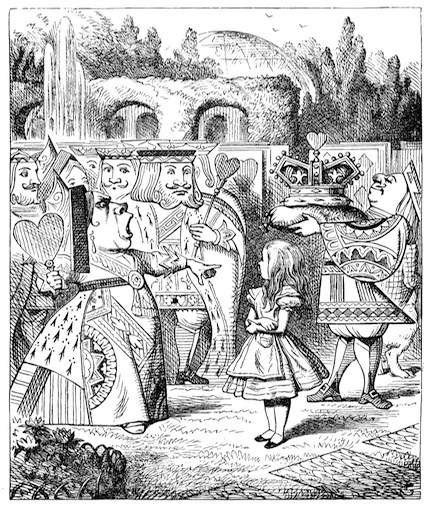 Throughout this book, Alice is depicted as steady in her sense of herself, while in its sequel she spends part of one chapter unable to remember her own name or place in her world. Even when she is uncertain of her name in this book, she is confident enough in herself to decide not to return to the upper world if it turns out she is a child with an unhappy sort of life. 'Majesty' is an altered form of the Greek word for 'greatest', megiste. The idea that a mother wouldn't know her own children is risible, to say the least. The exchange is surreal even within the context of Wonderland, considering the royal children had just been described in a way suggesting they were physically smaller than the gardeners, and it would be a surprise if they had the same sleeves and headgear as the royal servants! An impressively sized flower-pot, even if the gardeners were foldable. Giant flower-pots or elaborately painted replica chinese vases were once a regular feature of victorian décor. Travellers in canada can see a few examples of such giant vases in the chain of canadian pacific hotels built originally to serve cross-country train passengers in the late 1800s. These soldiers could easily have gone on to practice law, where a prime directive to anyone being asked a question under oath from their lawyer is to tell the truth while sticking precisely to the question. The White Rabbit has changed his attitude significantly, especially now that Alice is a bit bigger than him and apparently an equal of the Queen of Hearts. In real life, it isn't at all unheard of for a bully to be a cringing toady around anyone they consider stronger than them. Hedgehogs, most famously represented in videogame culture by a curious character named 'Sonic', are spiny little mammals. Their spines are quite reminiscent of porcupine quills, being made up of stiffened hair, but are not able to come out as porcupine quills are. The little animals are insectovorous, and appear to be one of several types of animals being considered as a means of pest control. Flamingoes being the famed pink birds of south america and africa. If they are unable to eat their usual food of brine shrimp, which they strain from the water with their large beaks, so conveniently solid and available for croquet mallets in Wonderland, they revert from pink to white colouring. Remarkably, flamingoes are among the birds that produce 'crop milk' a semi-solid that adult birds secrete from an expanded part of the esophagous where a bird can hold food for a time before it is digested. To a person unversed in croquet, this may sound like a real art of the game. Sad to say, this is a garden-variety ridge that Alice is considering. How there can be so many ridges in this particular croquet ground seems a bit of a puzzle, although we can come up with an answer. If you have ever seen a field set up for multiple concurrent games of lawn bowling, you wil find yourself faced with something that looks to many a canadian eye like an overgrown curling rink. There is a raised platform at either end of the field, and stretching between the platforms the ridges separating the bowling lanes. 'Furrow' is not such a common word anymore, although it shows up in expressions like 'to furrow the brow.' It is an old-fashioned term for the gouge in the ground left behind by a horse-drawn plough. What makes a furrow specifically different from a ditch is that there is material piled up along its edges on the otherwise unaffected ground on either side of it. In other words, the soil the plough tears up is thrown to its right and left as the horse or ox (or even person) drags the plough. This leads neatly to how we can talk about 'furrowing the brow' because this means we scrunch up our eyebrows very tightly, creating an indentation between our eyes and bunching up the muscles on either side of it. Croquet is usually set with four to six balls, yet there can be many more players in the game. The obvious way to solve the puzzle is to have the group playing divided into teams, with each member taking a turn to hit the ball when it is time for their team to play. Without such an arrangement however, and with everyone armed to some degree, even if only with bewildered flamingoes, quarrels would be inevitable. The most infamous example of a place where 'they were dreadfully fond of beheading people' is france during the Terror. Part of what led to the heinous reputation of beheading, apart from the obvious, it kills you, is that during the french revolution people who considered themselves nobility were made victims of beheading as well as people they considered their inferiors. Until then, arguably beheading was considered an unpleasant but humane form of death. It was presumably quicker and less horrific than a botched hanging, and the guillotine itself was invented as a humane device, astounding as the idea may be. However, during the french revolution, in one of the sadly common instances of fanaticism leading to wholesale terrorism, beheading was invoked as a means to purify the state and insure the revolution stuck, at least according to Robespierre and his cronies. Ironically, they probably delayed the revolution and prevented it from sticking at first. Well, anybody would run away at the prospect of being struck by a shiny ball, even if you were one yourself. The basic point here seems to be, based from what I have been able to decipher from the rules of croquet easily available to me, is that if you merely hit your croquet ball so that it smacks the ball of another player, this is called a roquet. Then, having roquet-ed the other ball, you get to set your ball in contact with that ball, and croquet it. It's not at all clear to me why you would want to do any of these things, unless it's in order to make it harder for your opponents to get their croquet balls through all of the arches, which is what you have to do to win the game. 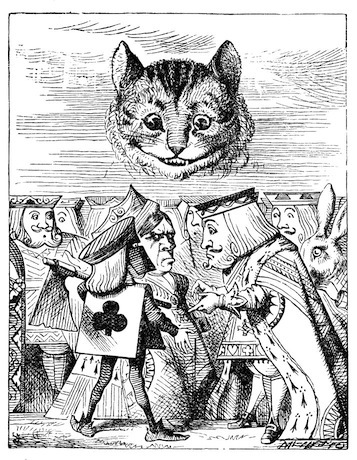 A sexist crowd would argue that the King of Hearts must be a timorous fellow, as evidenced by his response to the cat here, what with his wife being in charge. I suppose that depends on how you view the appearance of a large, floating, disembodied cat's head with its fair share of sharp teeth. The portrayal here is perhaps a jab at Prince Albert, Queen Victoria's husband, who died of typhoid fever after they had been married for twenty years. Since Victoria was the queen in england however, and the fashion for having male royals marry women who happened to be the eldest child of a dead monarch become the reigning monarch had gone out in England since Elizabeth I, he remained simply the prince, rather than the king and therefore was not in charge. According to Enough to Make a Cat Laugh: Catty Sayings, 'a cat may look at a king' is an old expression referring to something a social inferior to a monarch may have said. This meaning has vanished in canada as far as I can tell, and if anything would serve as a reference to the general tendency of cats to act as if they are in charge wherever they may be living, as long as the conditions are decent. Flamingoes can fly, but they are wading birds, not at all adapted to perching in trees. This is of course, quite true. 'Beheading' implies there is a body to take the head off of. Then again, perhaps the Cheshire Cat was the only character who knew how best to attend the croquet game, given the Queen of Hearts' propensity for ordering executions.